I’ve never been one to write an “issue book.” You know, the kinds of stories that champion a cause or shed light on a social problem. I have always considered myself more of a “fun” writer, quick to lighten a dark scene with a joke or a shared smile, the same way I do in real life. 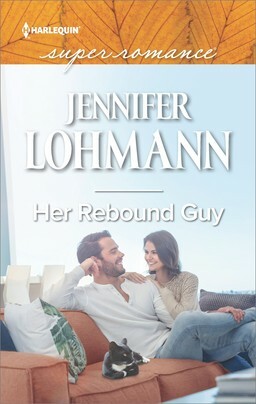 Writing for Superromance may have brought out my dark side. 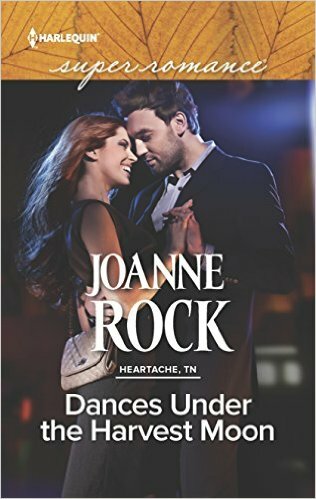 It occurred to me last week as I read a really lovely review of my October release, Dances Under the Harvest Moon. A reader mentioned my tasteful handling of heavy subjects. She went on to list those heavy subjects—and they were all so heavy!—and I thought, did I really write all that? Yup. Every last dark, heavy subject was in my book, and they’re the kinds of things you don’t pass off with a joke or a shared smile. This is in regard to Up Close and Personal, a 2008 Harlequin Blaze. Apparently I’ve been quietly tormenting my characters for longer than I’d realized. But I still like to think that I shine some light on those dark moments. 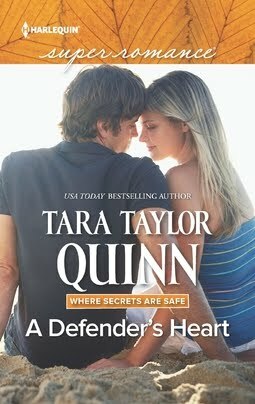 Maybe that’s how I’ve deceived myself for over a decade that I write fun books. More accurately, I think, I write characters who are determined to move past the dark times and embrace new joys. In my personal life, I try not to wallow. I’ve given this trait to many of my heroines—a strong need to find something positive in life, to always move forward. Take for instance, the heroine of Dances Under the Harvest Moon. Heather Finley is on the verge of going after her dreams when a health issue crops up that makes her re-evaluate everything. Her first instinct is to march on anyhow—ignoring the warning signs that her illness could slow her down. But you can imagine how well that plan succeeds if you’ve ever tried ignoring your own health concerns. 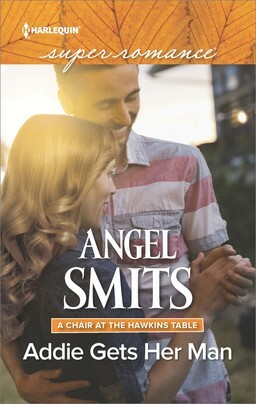 Heather needs to find balance—tempering her dreams with what she can realistically accomplish. None of us wants to compromise our dreams for this kind of reality check. But Heather’s situation is one many people with chronic illness face. There’s nothing fun or light about suffering with a chronic condition. Yet there is something really rewarding about finding a way to carry on anyhow-- to mete out a rewarding life in spite of illness—and find a way to still live joyfully. 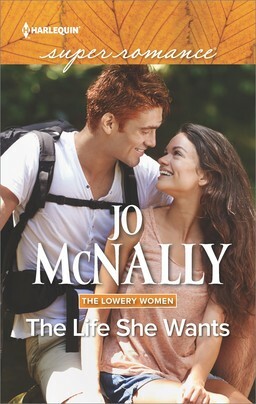 Romance embraces an optimistic view of the world and I do like to look on the bright side. Or at least search heard for a glimmer of brightness—no matter what hardships are in the past. ***As an optimist, I wish I’d gotten in on the #100DaysofHappiness trend I’ve been seeing online where people post happy things for 100 days. Let’s pretend we’re all adding something happy today—new shoes, a smile from a toddler, a long bike ride under a blue sky—what would be your happy snippet for today? 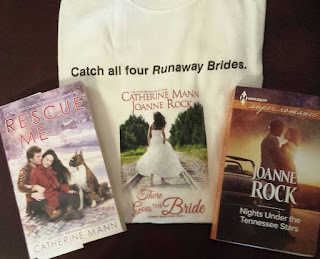 Add a comment and you’re entered to win the prize pictured including a Runaway Bride tee and books by Catherine Mann and me! My nephew and my new puppy bring a smile to my face! An easy way to make my day is happy is a even a short walk around the block with the dog. She's so happy to be out and about, that it always cheers me up! Rain!! Rain!! Rain!! It has been very dry here. Today the clouds rolled in. The rain is heavy & steady. Smells amazing too. Fall weather and the leaves that are starting to change! I've got pictures of my family on my fridge - I smile every time I see them! I miss having pics on my fridge. Why don't magnets work on stainless steel? ? Fun to see happy photos! Hope you are having fun!!! Holdenj is the winner of the thread prize!! Congratulations and thank you all for visiting! J, I am sending you a message. ..